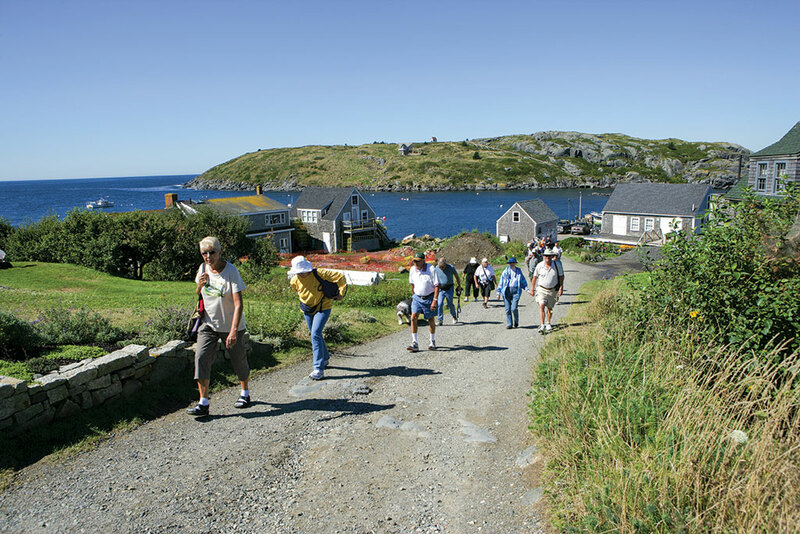 Ten miles out to sea, and 400 years after Captain John Smith landed on its shore, Monhegan Island remains a magical place for all who visit. But with its year-round community in jeopardy of becoming extinct, is the island in danger of losing its soul? Once dinner ended, I wasn’t ready to call it a night, so I set out to explore Monhegan in the dark. I grabbed one of the gas lamps used to illuminate the Trailing Yew’s guest rooms, then put it back and opted for my iPhone flashlight instead. The walk was short — the island is barely 2 miles long. The crashing waves punctuated the sounds of rustling gravel beneath my sneakers as I strolled past the church, two hotels, the soon-to-be-closed-for-good Carina Grocery and Deli, and up to the lighthouse, which stands at the second highest point on the island. During the day, as many as 10 painters might be perched on this hill. 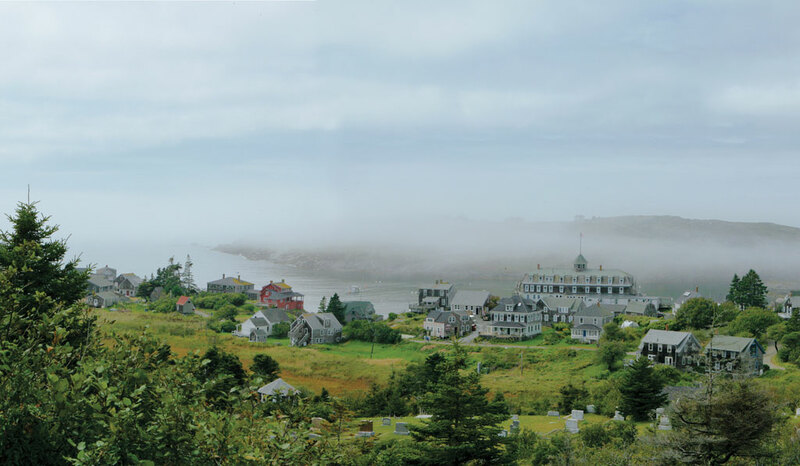 It overlooks the meadow at the heart of the community, taking in the Island Inn and Manana, the hunchback island that guards Monhegan’s harbor. Much of the village was still awake, and I could see most of the houses. I counted nearly a hundred illuminated windows as lightning crashed over Manana on this late-summer night. A month later, those lights would fade to a lonely few. And possibly, years from now, if the trend of year-round residents moving to the mainland continues, the scene will go dark for entire months at a time. [G]rab the Monheganvisitor’s guide before stepping on the Port Clyde ferry and it says in bold letters: Monhegan is a village, not a theme park. 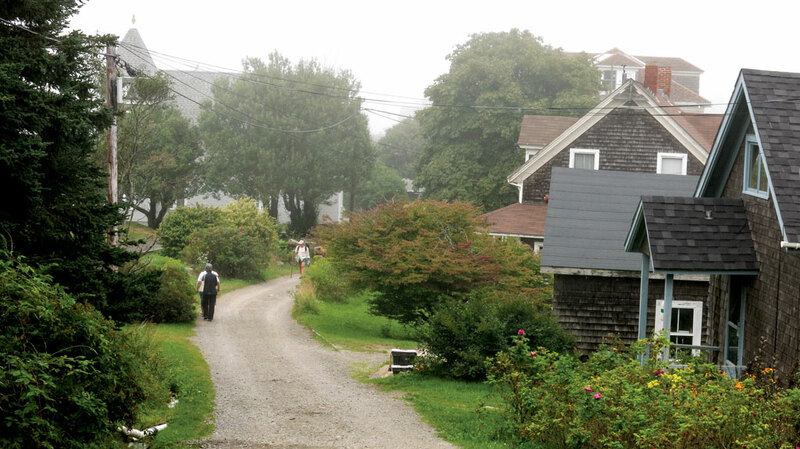 For all Monhegan’s beauty, midday at the height of tourist season can resemble Colonial Williamsburg. Hundreds of tourists armed with cameras swarm the dirt paths lined with shingled cottages. Many walk with a slow, curious pace, as if they’re listening to an audio tour of the island’s galleries, craft stores, and one-room schoolhouse. On my visit in September, a man wearing Google Glass ambled towards me, stopped near someone’s garden, gazed at it with his futuristic spectacles, and tapped on the glasses frame to take a picture. Or, perhaps he just was reading an e-mail. You can’t blame anyone for treating Monhegan as an exercise in photography 101. It’s quite possibly the most picturesque place in Maine. Before DSLR cameras, Edward Hopper, Rockwell Kent, Robert Henri, Jamie Wyeth, and countless other artists honed their techniques by painting the White Head cliffs, Lobster Cove, and the fish houses on the harbor. Not everyone treats the island with the same reverence as Wyeth, however. Marian Chioffi, the owner of the Trailing Yew, has to tell visitors not use her family’s swing set. Ronnie Short, a farmer, puts up with, but doesn’t understand, the photographic allure of him pushing a wheelbarrow. Mary Weber, the schoolteacher, has resorted to closing the schoolhouse doors to stop people from just wandering in. 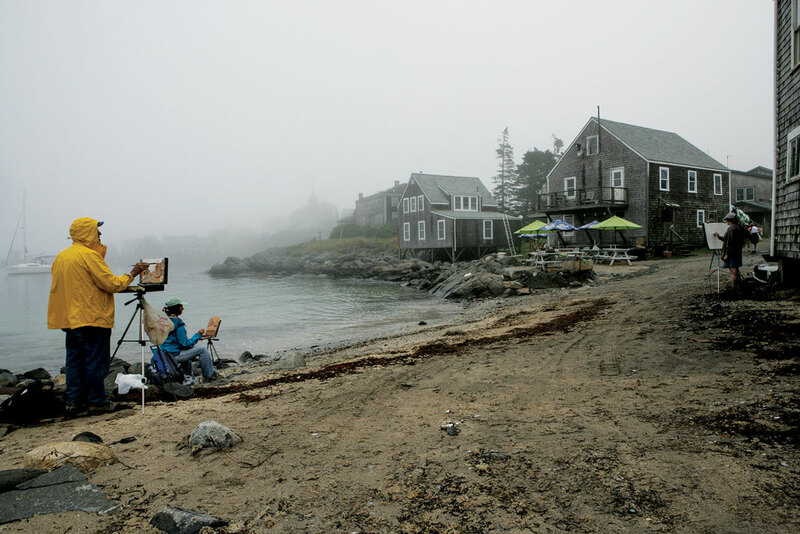 With the departure of the 4:30 ferry, the throngs of visitors disappear, but the day’s scene leaves a lasting image of what Monhegan is like when the year-round population is treated as if it didn’t exist. Chioffi’s office at the Trailing Yew is a mess, a testament to her busy life. She is the treasurer of both the school board and the fire department, a trustee for MISCA (Monhegan Island Sustainable Community Association), and the bookkeeper for both the library and the electric company. Scattered on her desk are documents showing that outside of some remote villages in Alaska, Monhegan pays more for electricity than any other community in the U.S. — an important fact in the ongoing discussion around wind turbines potentially being placed 2.5 miles southeast of the island.  Currently, the community and the University of Maine (who is leading the project with two other companies under the name Maine Aqua Ventus) are debating whether the energy benefits outweigh potential losses in the tourism and fishing industries. Monhegan is a fishbowl. Someone always seems to know where you are and what you’re doing at any given second. When I didn’t find Boynton at his house at the end of Main Street, I was directed to look for his gray pickup truck near the artist Alison Hill’s house. I flagged him down and rode with him as he told me about the island’s fishing industry. [M]onhegan is known for its unique winter-only lobster season. For more than a century, the island had a self-imposed ban on lobster fishing between July and January to conserve the resource. 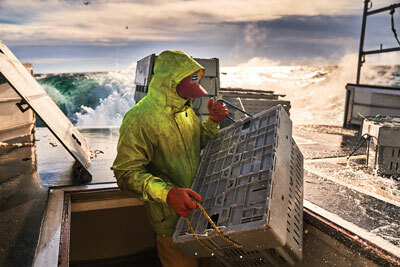 Trap Day, when the entire fleet of fishermen leaves together to set their traps for the season, used to be January 1. Then it was rolled back to December, and in 2007, when there was no longer a premium for winter hard-shelled lobsters and the fleet’s numbers had been halved, it became October 1. The fishing only lasts a few months, so most fishermen are done by Christmas. “That just took the heart out of the winter work and community and culture. January used to be the most exciting time of the year. 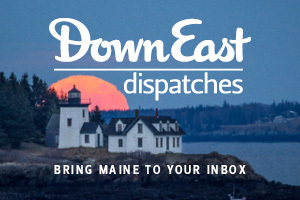 Now we’re just like any other isolated place in Maine without any jobs,” says Doug, who, like others, leaves for a two-month-long vacation at the beginning of the year. [I]n the Carina grocery’s waning days, I met with 37-year-old shopkeeper Tara Hire. Her light-pink v-neck shirt matched the Carina’s décor — the pink signage out front and the pink booths fashioned from pews where residents enjoyed coffee on blustery winter afternoons. The many layers of pink, combined with Hire’s warm smile and the audible tune of Journey’s “Don’t Stop Believing” masked the unpleasantness of the topic we discussed. MISCA purchased the building and now leases it to Brackett at an affordable rate. Without question, the grocery, as well as other island institutions like the Black Duck Emporium, post office, and town office, would not exist without this organization. Richard Farrell helped found MISCA along with several others in 2002 to address the problem of affordable housing. “People were living and working here, but there was no housing stock available at a reasonable price,” he says. With donations from summer residents, the organization is able to offer affordable property to those who demonstrate a commitment to the community. The struggle to get people interested in year-round housing remains, but the organization is integral to the future of Monhegan. [M]aking a living on Monhegan means working in concert with the island’s geography. True, a growing segment of the community telecommutes, and there will be manual labor jobs as long as there are summer residents, but the backbone of the island’s economy has always rested on its distinct environment. Traditionally that has meant fishing. 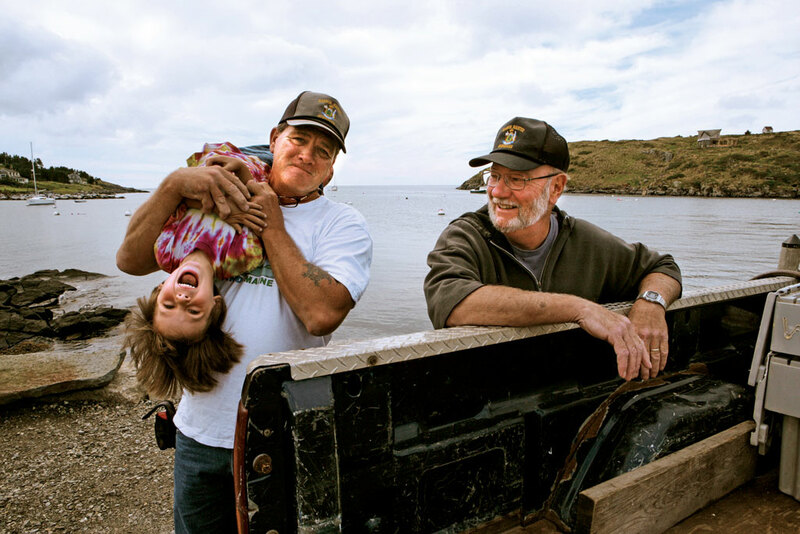 As Boynton likes to say: “Monhegan is all captains, no crewmembers.” But as fishing’s future remains foggy, a few entrepreneurs are expanding the idea of what it means to be a captain and providing a creative vision for the island’s future. Down Lobster Cove Road, the island’s smell jarringly shifts from a gentle sea-tinged air to a full-on sinus blast of bitter hops. 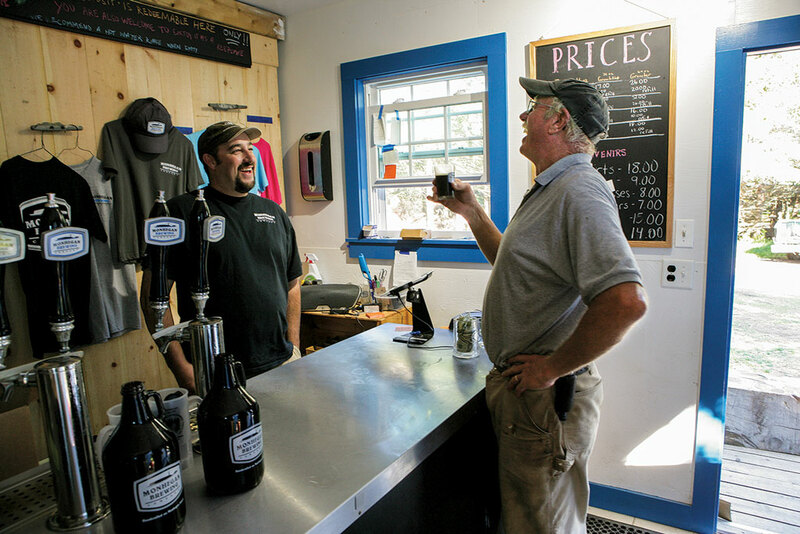 In a wooded area, before the dirt road narrows to a walking path to the shore, is Monhegan’s newest (and most potent) venture — the Monhegan Brewing Company. Matt Weber, a 35-year-old fisherman, is the gregarious face of the operation, along with his wife Mary, who is leaving her job as the schoolteacher to focus on the business year-round. “We planned to always have three beers on tap for people to taste. But we sell out too quickly for that,” he said. As I sipped on a Shipwreck IPA in their tasting room, a group of older women wearing flower-print vests and sweatshirts walked in, a bit confused, albeit intrigued. Matt treated them, as he does everyone, like they were longtime customers. “Ladies! Would you like some beer?” All customers ask the same questions: Where do you get the water? (From the couple’s well across the street.) Do you stay open all year? (No, the pipes would freeze.) Do you sell beer elsewhere? (In Rockland and Camden, but it’s been too popular to save much for bottling.) When the crowd cleared for a moment, Matt noted that it was a slow day despite the constant stream of paying customers. He wasn’t boasting, he just couldn’t believe how popular his business had become. 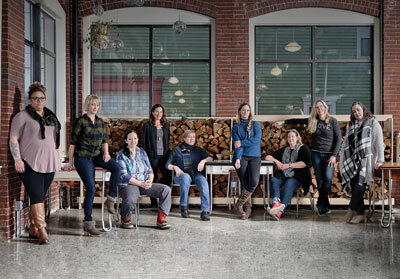 While Matt and Mary use Monhegan’s water to brew, Kathie Iannicelli is cultivating its earth and Tara Hire is harnessing the island’s qi. In the wake of the Carina’s closing, Hire started Monhegan Wellness. Through multi-day packages of yoga, hiking, and wholesome eating, she taps into the elusive but oft-touted “magic” and uses it to promote healthy living. 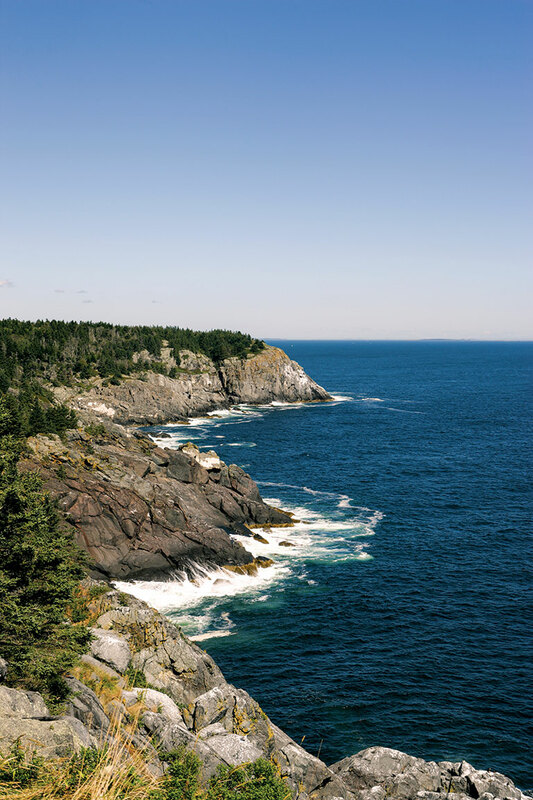 Hire and Iannicelli believe that visitors want to connect with Monhegan on a deeper level, beyond merely buying a sweatshirt and a bumper sticker. Hire hopes that desire translates to meditative retreats, while Iannicelli has already seen it transform her small farm into a thriving business. The island doesn’t have enough suitable land for a large farm, but Iannicelli, a full-time resident for 22 years, figured out there are enough small parcels to supply the entire island with produce. She made arrangements with homeowners to grow crops on 13 separate pieces of land totaling 2 acres in all. That’s enough to offer 24 weekly CSA (Community Supported Agriculture) shares and supply a bustling Tuesday farmers market. It’s also had the somewhat-intended effect of luring a younger generation to the island. 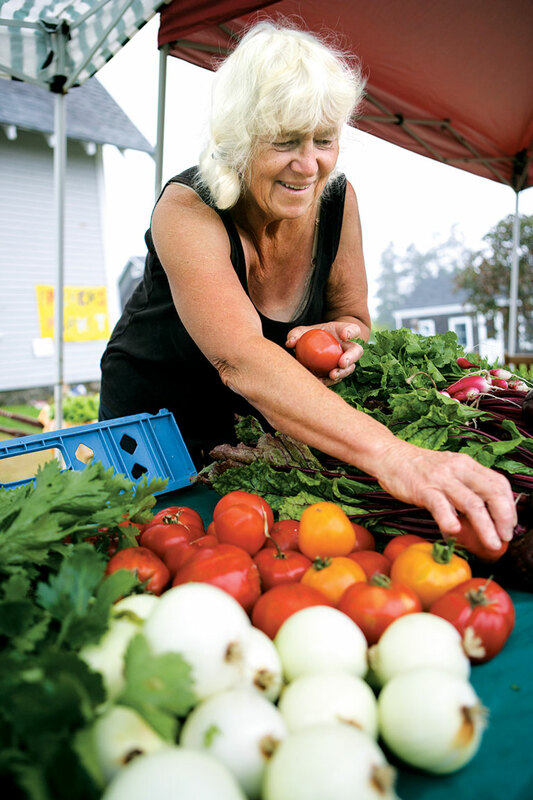 Iannicelli is 70, but many of her summer volunteers are millennials who can be found sorting the produce, pressing cider, and selling goods at the market. lander who first came to work for Iannicelli in 2010, truly wants it. “This is as much my home as anywhere else,” he said to me while dropping off bags of vegetables on the doorsteps of the island’s cottages. “I want to be in this community. I’ve talked to year-rounders and they’ve told me I have the right personality to make it work.” Ronnie moved into one of Doug Boynton’s year-round houses, and has recently joined MISCA so that he can eventually purchase a home of his own. Over the winter he lobstered and performed trail maintenance for the Monhegan Associates — the organization that protects the island’s 480 acres of undeveloped forests and cliffs. Ronnie is only one person — hardly enough to reverse a decades-long trend — but there’s guarded optimism that more like him won’t be too far behind. [B]ut why is it important to maintain this community? Should keeping those lights on around the meadow in the dead of winter matter to anyone outside of 40 residents? 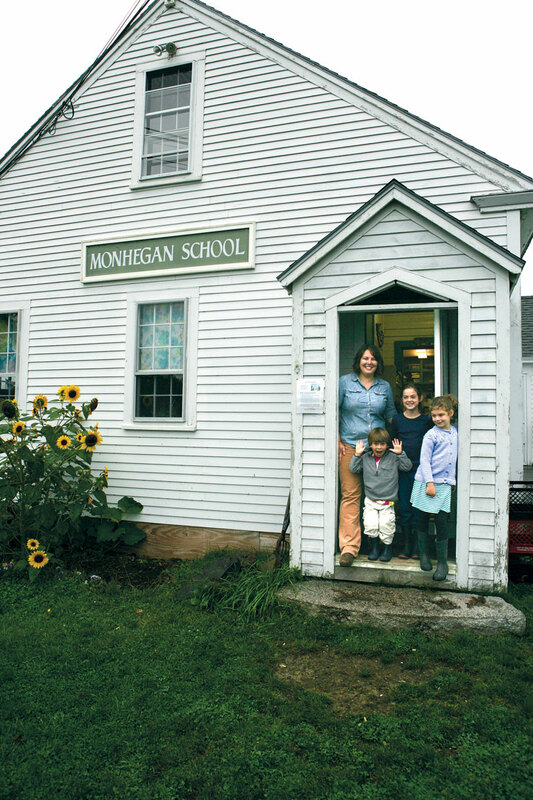 It won’t impact the day-to-day experiences of 99 percent of the people who visit Monhegan. But something would be missing, year-round residents say. Visitors won’t be able to put their fingers on it, but Monhegan just wouldn’t feel the same. 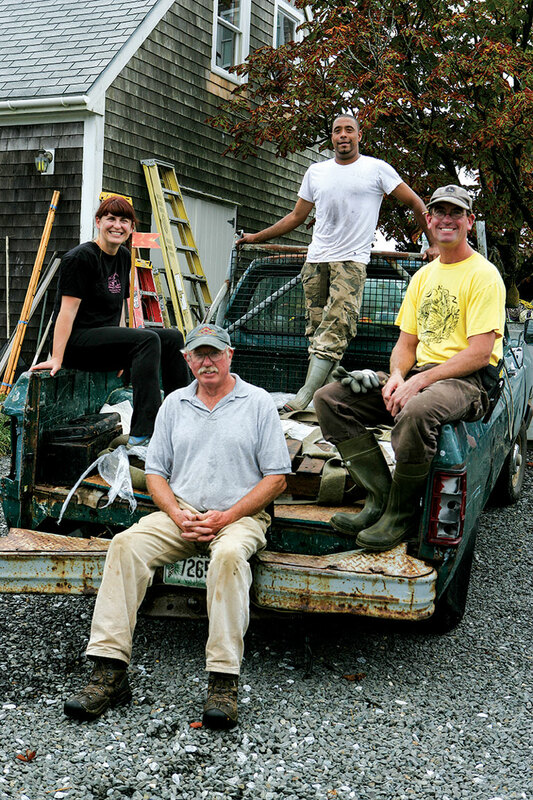 To Tara Hire, the soul of Monhegan lies in the community. 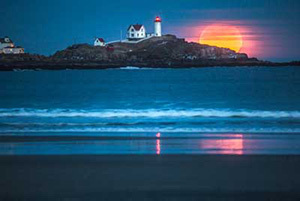 Mary Weber says it just wouldn’t have that same magic, and the preservation of island life is part of Maine’s appeal. Richard Farrell thinks it’s symbolically important to the rest of the world for a community like Monhegan to exist. Doug Boynton believes islands, as contained entities, serve as a needed place of experimentation. Marian Chioffi, meanwhile, won’t entertain the question, because she and her brother will be here for eternity, she says. She shrugged, turned around, and walked through the fog to Kathie Iannicelli’s to spend the morning working on the farm.